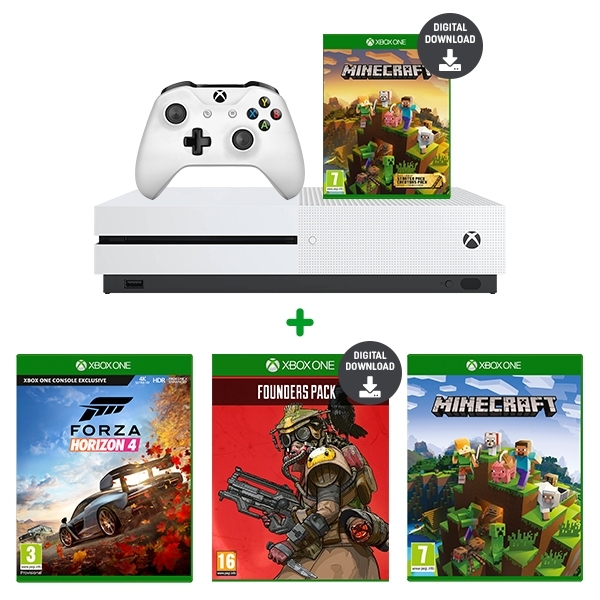 Bundle includes Minecraft Creators Bundle, Apex Legends Founders Pack*, Minecraft & either Forza Horizon 4 or Crackdown 3! Valid from Apr 16th - 29th, while stocks last. As bundle contains a digital download, payment will be captured upfront. Enjoy great content from Minecraft community creators including Relics of the Privateers, Adventurer’s Dream, Wildlife Savanna, Winter Mini-Games Festival, and more, as well as 1,000 Minecoins to get even more in-game content! Also, join the online community of Minecraft builders and players with a 14-day Xbox Live Gold trial. Build, dig, and craft together with friends who are on PC, mobile, VR, and console. The best value in games and entertainment - Whether you’re watching 4K movies, or streaming gameplay, there’s never been a better time to game with Xbox One. The only console designed to play the best games of the past, present, and future - Play over 1,300 games including more than 200 exclusives and over 400 classics from Xbox 360 and Original Xbox. Watch 4K Blu-ray™ movies and stream 4K video on Netflix, Amazon, Hulu, and more and experience richer, more luminous colours in games and video with High Dynamic Range technology.  Xbox Game Pass gives you instant, unlimited access to over 100 highly-rated and fun games, with new games being added all the time.